Dan Behm, president and co-founder of Open System Technologies, an IT firm based in Grand Rapids, has been named the Grant Thornton Leader & Innovator of the Year. Phil Hagerman, president and CEO of Flint’s Diplomat Specialty Pharmacy, 2011 Leader and Innovator of the Year, introduces Dan Behm, CEO of OST in Grand Rapids, 2012 winner of the award. The award was announced at Thursday night’s reception at Lawrence Technological University, which co-sponsors the annual award along with Grant Thornton LLP, WWJ Newsradio 950 and the Great Lakes Innovation and Technology Report. Behm was chosen from nearly 50 nominees profiled during the past 12 months in GLITR. The Leaders & Innovators program was developed in 2005 by Lawrence Tech to recognize Michigan business and nonprofit executives who are engaged in cutting-edge professions and industries expected to be key to Michigan’s economic future. The profiles that appear on Tuesdays in GLITR are edited by Matt Roush, who served as master of ceremonies at the reception. “The collective work of the individuals recognized this year is truly changing opportunities and diversifying the economy in our state. 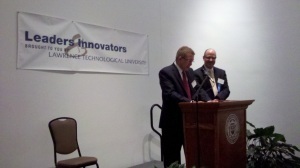 They are an inspiration to us all,” said Lawrence Tech President Lewis Walker. Founded in 1997, OST was originally a computer hardware sales company. Under Behm’s leadership, OST has become a $68 million technology company driven by software and service in four growing economic sectors: health care, manufacturing and distribution, finance and insurance, and enterprise technology. OST is an employee-owned company with an award-winning culture. Its professional IT offerings include application development, managed services, and data center products and services. It builds custom apps for businesses, provides outsourcing of server and storage administration, and helps large companies optimize the performance, availability, and capacity of their servers and storage. Over the past three decades, Behm has worked with more than 500 customers and partners in the technology marketplace and now uses his broad experience to help OST customers make transformational changes to enable them to compete in the marketplace. In 2011, he won the Ernst &Young Entrepreneur of the Year Award for Michigan and Northern Ohio in the technology category. He serves on the advisory board for the HP division of Arrow ECS, an $800 million distributor of HP hardware and software. Behm serves on the Metro Health Foundation in Grand Rapids, and OST supports local community nonprofit agencies such as Steepletown, Kids’ Food Basket, Supper House, and many others. After graduating with honors from Michigan State University, Behm spent 10 years with IBM as a senior buyer, manufacturing and systems engineer, and advisory sales rep, before co-founding OST. In accepting his award, Behm said it’s possible to look at parts of Michigan and “feel like we lost our heart …. there are still places where it’s painful, and a lot of people are still out of work.” But he said he now believes “Michigan is really starting a turnaround. It’s been a long 10 years, but the sun is starting to shine through.” And he said entrepreneurial business is a major part of that recovery. Lawrence Technological University, www.ltu.edu, is a private university founded in 1932 that offers more than 100 programs through the doctoral level in its Colleges of Architecture and Design, Arts and Sciences, Engineering, and Management. Students benefit from small class sizes and experienced faculty who provide a real-world, hands-on, “theory and practice” education. Activities on Lawrence Tech’s 102-acre campus include over 60 student groups and NAIA varsity sports.